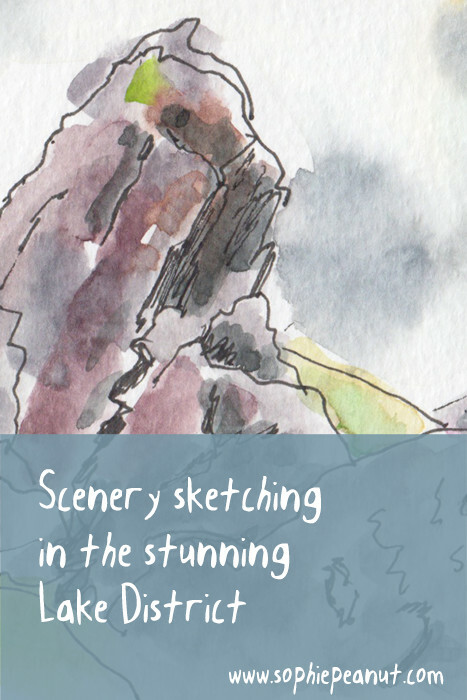 A weekend scenery sketching in the stunning lake district sounds idyllic, doesn’t it? It is. But keep your imagination in check and expectations realistic – unless you are one-half of the ‘Perfect Instagram Couple’. Have you come across social media pictures that show ‘What you think you look like when you run’ (strong, elegant, flowing) and ‘What you actually look like when you run’ (not so flattering)? I often find this gap in my life. Not just that I look uncool when I run (I do), but that my expectations tend to be far grander than reality. Looking onto Skiddaw from Braithwaite’s campsite in the Lake District. 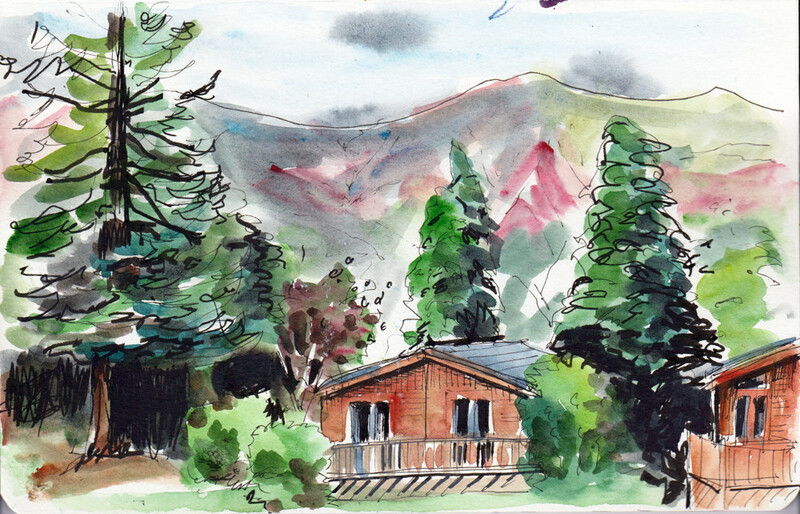 Sketch in pen, brush pen and watercolour. So when we set off for a one night stay in the Lake District, my head filled with pictures of dramatic scenery. I enthusiastically packed two sketchbooks, watercolours and various pens and pencils. I imagined I would fill page after page with magical scenery sketching. In fact, it rains a lot in the lake district, so the beautiful scenery can be hidden by low clouds. I was travelling with four other people (3 of which children) who have no interest in sketching. It was a one night trip. So you might have guessed – I didn’t get as much sketching done as I had hoped for. It was dull and foggy when we arrived. The views were limited. Some of the clouds lifted in the evening and I managed a quick sketch. The Lion and Lamb at the top of Helm Crag. 15 minutes sketch in pen and watercolour. The next day the sun came out and the landscape came to life. 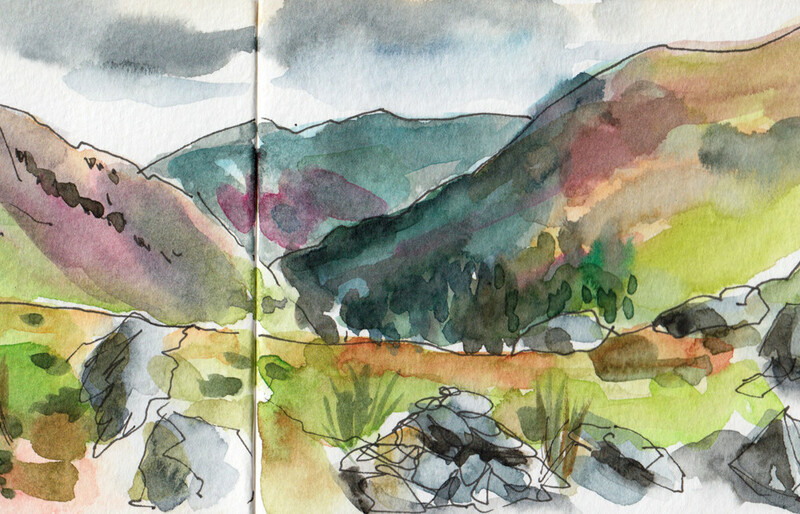 We went on a hike and I stopped for some scenery sketching at the top of Helm Crag while the rest of the family walked further along. 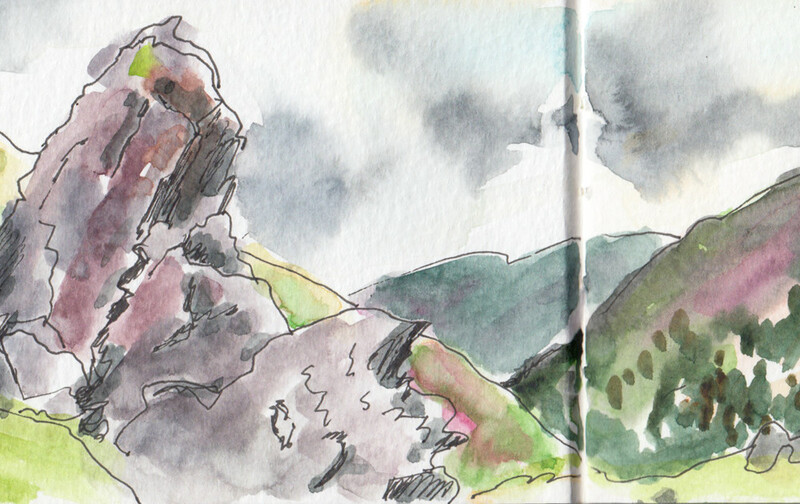 I managed two quick landscape sketches in my pocket Moleskine sketchbook (above and below). While I was finishing my second sketch a couple that I can only describe as the ‘perfect Instagram couple’ came to peep over my shoulder. They chatted and looked at my sketches and left. Both were very tanned with toned bodies in designer sports clothing. They stopped and posed for selfies – a lot. The beautiful scenery seemed to be just another accessory to pose with for a cool photo. Views from the top of Helm Crag. 15 minutes sketch in pen and watercolour. As I watched them disappear into the distance I wondered if they too had a super glossy picture of their lives in their minds. Was there a gap between their imagination’s musings and reality? Maybe they imagined everything messy and imperfect but whatever they did their lives turned out incredibly glamorous? Or was everything they did organised and edited so it would make a good picture? My family was calling, so I packed my sketching kit and (gladly) went back to my messy unedited reality. All of a sudden glamour and perfection didn’t seem so attractive. Thanks for the great sketches. I draw OK but then put on too much watercolor. I am looking at the Daniel Smith Primtek colors to calm things down. Watercolour is tricky to get right sometimes. Enjoy your sketching.